Earlier this year, the researchers revealed yet another leap forward in neural prosthetics with successful animal tests of a completely wireless, implantable sensor that may lead to an untethered version of BrainGate. Rehabilitation for people who have been severely paralyzed or required limb amputation may become a more intuitive process with next-generation prosthetics incorporating such technology. Also, as wifi-enabled devices continue to change the way we interact with the world around us, similarly enabled assistive medical devices may offer even greater independence and a better quality of life for people who have sustained significant injuries. In addition to support from NIBIB, the researchers have received funding over 40 years from the Eunice Kennedy Shriver National Institute of Child Health and Human Development, National Eye Institute, National Institute on Deafness and Other Communication Disorders, National Institute of Neurological Disorders and Stroke, the Department of Veterans Affairs, and other federal agencies. “We are especially proud that this prize reflects the impact on humanity that results from carefully performed, publicly funded science and engineering," said Donoghue. The B.R.A.I.N. 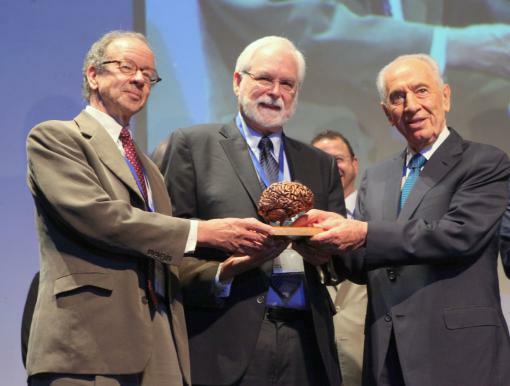 (Breakthrough Research And Innovation in Neurotechnology) Prize is sponsored by Israel Brain Technologies, a non-profit organization with a mission “to advance Israel’s neurotechnology industry and establish the country as a global hub of brain technology innovation.” The prize and the brain technology-focused conference at which it was awarded—BrainTech Israel, also a first for the country—reflect Peres’ vision of positioning Israel as a global leader in brain research.